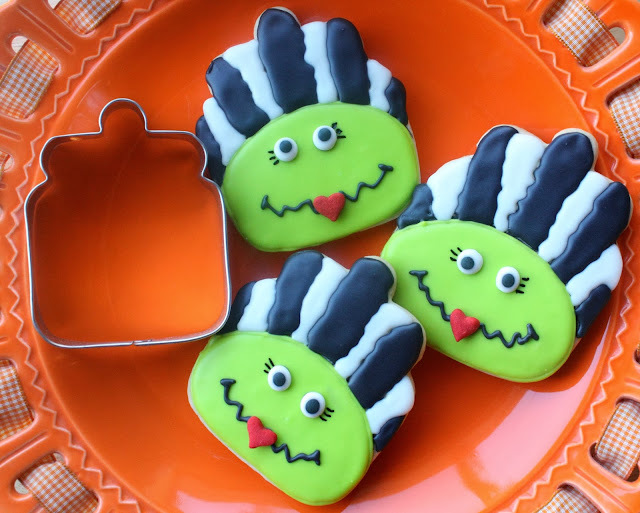 A friend of ours requested Halloween cookies for her niece and a friend's children, with my choice on which cookies to make:) I chose Frankenstein, pumpkins and skeletons, but came up a few cookies short with the batch of cookies I made. 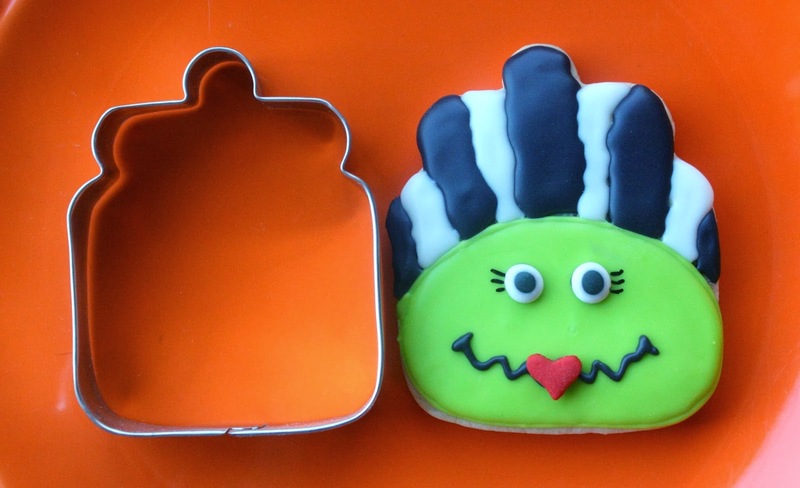 I have wanted to make Bride of Frankenstein cookies for some time, so when I looked at the cutter and the protruding knob on the cookie jar I thought that maybe, just maybe it would somehow work with the Bride's straight up hairdo. So, I traced around the cutter, sketched it out, and sure enough it did work! I was pretty excited because I am still a fledgling with cookie cutter versatility~making a cookie with a cutter intended for another design. I was pretty happy with the results! Besides Sugarbelle, Lisa The Bearfoot Baker has also been inspiring me with her cutter creativity! I am smitten every time I visit her blog, and I'm sure you will be too! Thanks so much for the inspiration you two! 1. Mix up a batch of sugar cookie dough. 2. Roll out dough, cut out cookies with cutters and transfer to parchment-lined baking sheets. 3. If needed, freeze dough on sheets for 10-15 minutes so that they will hold their shape longer, before baking. 5. Let cookies cool for about 10 min. on baking sheet and then transfer to cooling rack to cool completely. 7. Tint some of the icing, green, some of it black, and keep the rest untinted. 8. Using the green icing and a #3 tip, outline the face, and then fill it in. Let it dry for at least an hour. 9. Using the black with a #3 tip, outline the black segments of the hair and fill it in. 10. Let the green and black dry completely before continuing. 11. With the black icing and a #2 tip, make a mouth and while wet, gently place a heart sprinkle in the middle. 12. Dab a small dot of white royal icing on the back of the eyes and place gently on the face. 13. Using the edible marker make eyelashes on both eyes. 14. With the white icing, fill in the remaining segments of the hair, and let dry completely. If you want to make your own Bride of Frankenstein cookies, but don't have a proper cutter, or even a cookie jar cutter, look through your collection of cutters and see what you can do. It's fun! They look really fun and sweet! What a super creative and fun use of that cutter! Love it, Sue!! SUE!! The Bride of Frankenstein is AMAZING!!! I never saw the cutter as a character but, you have inspired me beyond belief this morning! You go girl with you mad "think outside of the cutter" skills! I am pinning now. Thanks so much for the shout out! You made my day!!!! Such a great idea...so creative! Cute!!!!! !, Question... are the sugar cookies hard or are the soft after baking? Wow - so impressive! I never would have seen the bride of Frankenstein in the cookie jar cutter. Again...you're a genius! These are cute as can be! These are brilliant! Sue you know I love everything you make! Thanks for your sweet comment, Hani! Thank you, Joni! I would LOVE to get together with you and Jacqueline!!! Thanks so much for all of your support, Michelle! These are so clever and cute! So many uses for that cutter, right?? These are SO fun Sue! Great job! I LOVE these!! they are so adorable and so fun!! Cute and cute!! I love these sooooooooooooooo much. Your cookie think BLEW my mind! I really love your version of the Bride of Frankenstein. What a creative use of cookie cutters. I'm pinning them! Oh my gosh, Sue, these are so cute!!!! SO CUTE! I always look forward to your posts they are always so creative! What an innovative idea! Love them! These are so adorable! What great use of a cookie cutter.